Here’s another article I wrote for our church newsletter. Deron will be back next week, but I’ve appreciated the chance to stretch my writing muscles while he’s been gone! The most exciting part of the creation account to me is that God decides to make Adam and Eve in His image. How awesome is that?! Just by being alive and being human you are already an image-bearer of God. You are Imago Dei. Everyone you meet is Imago Dei. Hold that in your heart for a moment and see if you don’t get excited. That’s some good news, people! On the flip side, however, I don’t think that any of us would say, “This livin’ like Jesus thing? I’ve got it down pat. I am holy as God is holy. Done and done.” We’re just not there. We all fall short. We’re image-bearers who also bear the dust, bruises, and scars from falling short of our holy callings on a daily basis. We must be about the work of becoming. I think this is part of what makes the good news of Christ’s redemptive work in our lives so very good – I’m talking “good” in the creation-narrative-and-God-saw-that-it-was-good sense. Jesus, by His life and death, makes it possible for us to be restored to our original state of Imago Dei. Don’t miss that God twice makes us “what we already are”: first in lovingly creating us in His image and again in graciously sanctifying us and restoring us to that state of shalom goodness. God patiently and faithfully stays with us as we live in a perpetual state of “becoming,” all the while knowing that “we already are.” It’s like the inaugurated eschatology (there’s your $2 theological term for the day) I mentioned last week regarding God’s kingdom – we are already what God created us to be but not yet fully. We are still in the season of Epiphany – the season in which we recognize that Jesus is, in the fullest sense, Imago Dei and the Son of the Most High God, that He is fully God. In two weeks, however, is Ash Wednesday, the beginning of the season of Lent. For centuries, Christians around the world have observed the Lenten season as a time of repentance and reflection as they prepare to commemorate the death and burial of Christ and celebrate His resurrection. It seems so fitting to me that we move from a season of recognizing who Jesus truly is to a season of repenting and recognizing that we are not yet fully who we were created to be and who we “already are.” May every season of your life be a season of “becoming” and growing into whom God made you and then redeemed you to be. May we each be reminded this week of who Jesus is and what He’s done for us to enable us to keep becoming more like Him. This is a post I had started for this blog, but I had the opportunity to write our Campus Minister’s column for our church newsletter for this week and next while he’s away at his DMin residency at Lipscomb, so I published it in our newsletter. Jeffrey and I recently watched the acclaimed Ken Burns’ documentary, The Civil War. This nine-part series takes a detailed, critical look at the death and destruction that consumed our country during the four-year war through the lens of personal memoirs of different people from all walks of life. It was fascinating. As interesting as the documentary was, however, it was even more devastating and disturbing. Many of you may know that I’m a pacifist. The violence of war and of slavery are viscerally and physically sickening to me. The hatred and depth of racial discrimination is almost more than I can bear to consider. Not long after we finished the documentary, we watched Lee Daniel’s The Butler, a fictional story (based loosely on a true story) that chronicles the life of a man who was born in Georgia in the 1920s into a sharecropping family (really something that was closer to slavery than any of the cooperation implied by “share”) and then saw his father casually murdered without provocation by the landowner. The protagonist eventually came to be a butler in the White House, from which vantage point he saw the turbulent civil rights movement span eight presidencies. As I lay awake one night after having watched these two pieces, I was struck by the recentness of it all. We live in a world where we have video – video! – of Civil War veterans speaking and shaking hands over the memorialized battle line at Gettysburg. Men who fought in the Civil War lived in our modern age! We live in a world where a person born into what amounted to slavery – a world where black men could be killed by white men without consequence – could live through times of sit-ins, freedom rides, school integration, and countless acts (seen and unseen) of prejudice-motivated violence to see a black man become president! It hurt me more, somehow, to realize how recent all of it is. I found myself longing to live in some distant land without a recent history of violence and racial discrimination and oppression. I didn’t want any of these bloody wars or any of the racial turmoil to be part of the past or, more precisely, the present, of the country in which I live. I thought of maybe Sweden or Norway, mostly because I don’t know much about either of those countries, and thought maybe that was because terrible things hadn’t happened there (history isn’t really my thing). Guess what: even the Swedes and Norwegians have had (and still have) their violence and racial rifts. What I’m really longing for is not an area of land bound by imaginary lines that only exist on a map. What I’m longing for is for God’s Kingdom to be here in its entirety. It’s already here, but not yet fully. I’m longing for it to be fully present and realized. Deron’s been reminding us that, in this season of Epiphany, we are celebrating the manifesting of Jesus as the Son of God. One of the ways we’re called to celebrate is by showing the world that the Prince of Peace is here! The King – who forsook everything for all peoples, for all times – reigns! We are to be light in the darkness around us – the darkness of our country’s past and the darkness of our present realities of continuing hatred and violence. Let us strive to be lights of the peace and the love of Christ together, ‘til Kingdom come (fully). It’s not fun to have a sick little one. It’s not fun for her and it’s not fun for Mommy and Daddy. The weekend before Christmas, Paige was still pretty sick. She didn’t feel well – not like herself – and she was tired of not feeling well. She wasn’t into playing. She was not her sparkly, happy self. Her little eyes were still glassy and she was just a pitiful little thing. Then, on Sunday evening, I got a text from a friend at church asking if I could come to the door. I missed the text at first, because Paige was just waking up from a nap. When I texted her back, she replied that there was a care package at the door. And what a care package! The box was full of lots of fun toys and even some fun family projects like Snoopy Doghouse Gingerbread Houses to decorate! 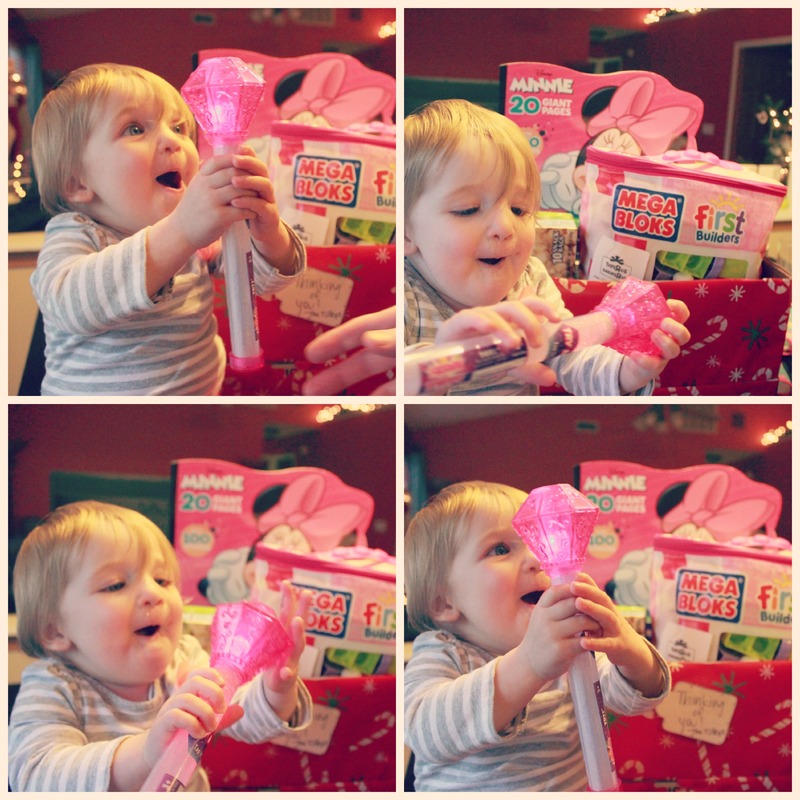 But, by far, Paige’s favorite part was the light-up wand. What a blessing! That was the first time Paige’s eyes had lit up since she had been sick! She was our happy little girl who forgot for a few minutes that she didn’t feel well. Our church family is a source of constant blessings for us. We were covered by so many prayers when we were in the hospital, and we knew it. The doctors were on the verge of admitting Paige because her fever was not coming down. They wanted to try one more thing before admitting her. I was not super optimistic. However, that one thing worked! In just one hour, Paige’s fever dropped from almost 103 (I don’t remember the exact) to 98.9! For sure felt the prayers of our families and church families. It wasn’t our plan to stay in Lafayette. Jeffrey and I were planning to move back to Nashville where I did my undergrad after I finished my graduate work. But, in the first semester of my PhD, we realized that we felt more at home in Lafayette than either of us ever had before. That “home” feeling came from our church family, and we couldn’t imagine moving. So we made the choice to stay. I’m not doing what I thought I’d be doing when I grew up, but I actually work for my church family now, so you can’t beat that. We’re so blessed to be part of the Elmwood family! There needs to be a holiday name for the Saturday after Thanksgiving. It’s one of our favorite days of the year and includes a number of family traditions that are important to us. 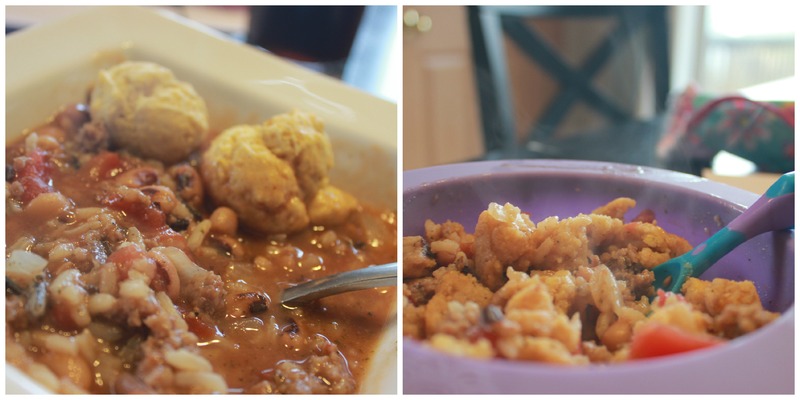 Tradition number one: Be at home and eat leftovers, glorious leftovers. Tradition number two: Go cut a Christmas tree. 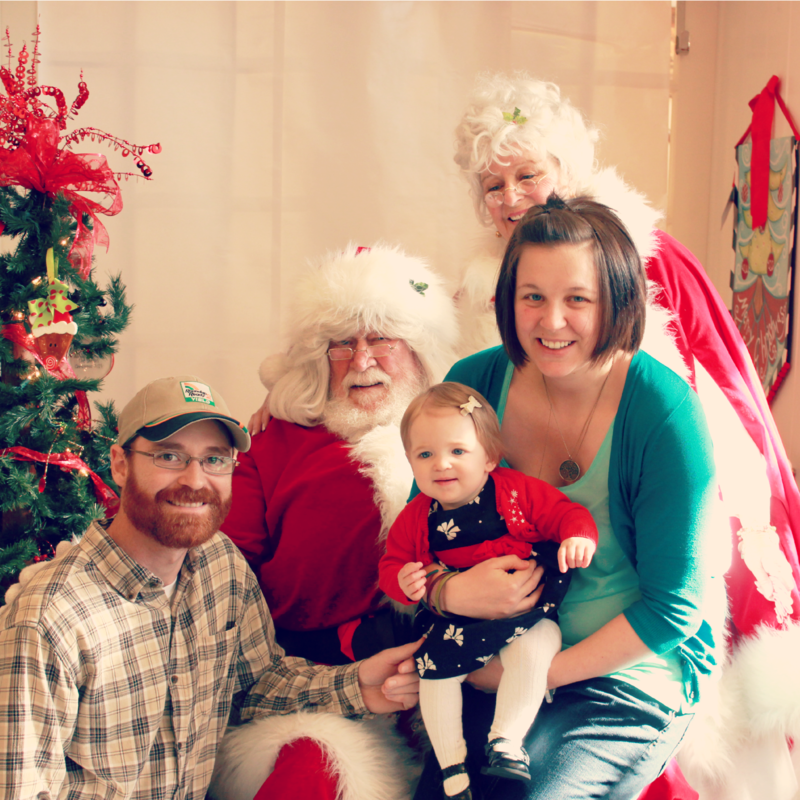 This year, we added a third tradition: Take the Bug to see Santa! 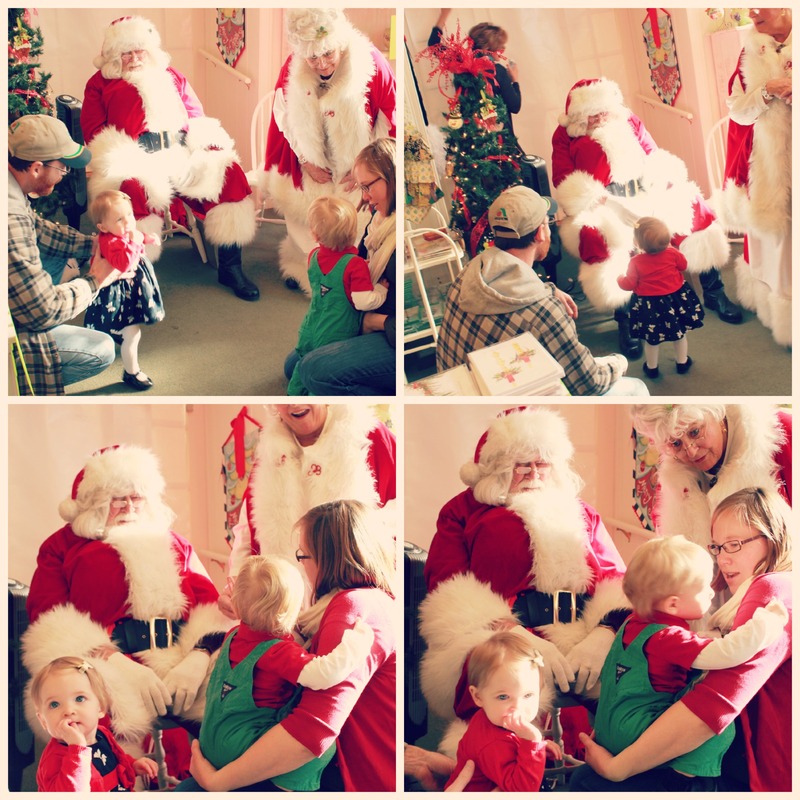 Last year, we got Paige over to see Santa at the mall. It worked out to do it when Grandpa and Grandma Ravellette could come, too, and it was fun! Paige even got to wear the new red velvet Christmas dress that her Grandma made her. However, when Santa visits the downtown shops instead of the mall, he brings his awesome wife, Mrs. Claus, which makes for an even cooler experience. So, this year on Family Saturday (Does that work as a holiday name, or does it just sound like we never spend any other Saturdays together? I’ll keep working on it.) we headed up to Cassen’s tree farm in West Lafayette to pick out the perfect tree. My mom was in town, so she came with us, which turned out to be a great thing not just because we love having family visiting us, but also because no-nap Paige finally succumbed to a nap on the drive out to the farm, so Grandma Rose stayed in the car with her while Jeffrey and I picked out a tree. So we didn’t get any pictures at the tree farm, but we also didn’t have a 1-year-old to keep track of while we were felling a tree, so there’s that. The tree we found was great. Perfect for our spot at home. But here’s what I’ll say about cutting down a Christmas tree: it never looks that tall in the field. Jeffrey had to get out the extension ladder to put the star on top and get the lights all the way up the tree. The star kinda scraped the ceiling. Oops. Anyway, after we finished at the tree farm, we drove downtown for our visit with Santa. I changed Paige into her Christmas dress. 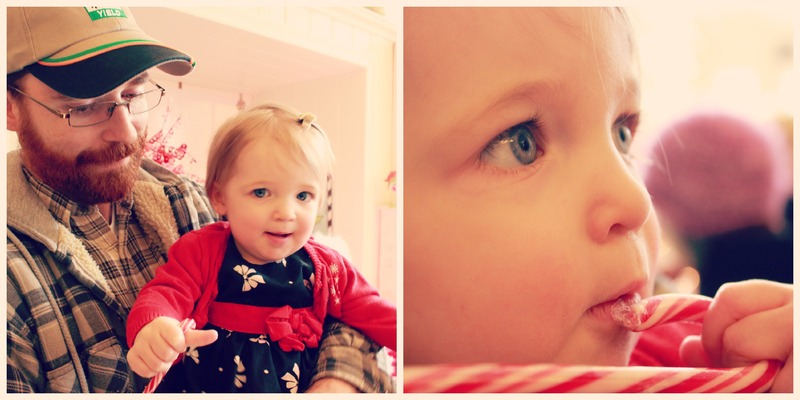 (Which, by the way, was a 6 month dress from last winter that still fits her… sweet tiny baby. The dress I got her for this year might fit her when she’s six.) I imagined this beautiful photoshoot. The shop we were going to (which is owned by a lady from our church) has tons of indirect natural light and is just beautiful. Paige in her dress with her bow and red sweater. Santa. Mrs. Claus. Big smiles. Classic. 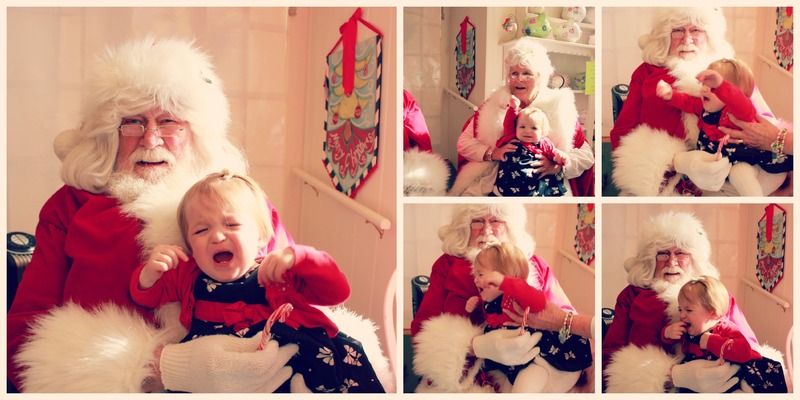 You may think that I’m insane to think that my toddler would do well and smile when she visits Santa, but I was not wholly basing my expectations on fantasy. Last year, Paige was an absolute pro with Santa. So, yeah. I was expecting to add some more natural light, Mrs. Claus, a cute little shop. Boom, baby. Christmas photo magic. But Paige is older and wiser now, and apparently that means that she is no longer trusting of strangers with long white beards. Recovering from the Santa trauma of ’13 with Daddy snuggles and a candy cane… still in the wrapper. Then, Paige’s good friend, Joel, came to the shop with his family. We thought that maybe if the two kiddos got to see Santa together, they’d like it better. It didn’t really work. Paige was a bit more curious about Santa, but they both affirmed the other one’s trepidation about Mr. Kringle. It wasn’t the perfectly perfect photo with Santa, but we had a great time with this new Saturday-After-Thanksgiving tradition. Maybe next year Paige will be old enough to understand bribery and we can bribe her with the candy cane to sit and smile with the Clauses. Our good friends, Kate and Gilbert, introduced us to this awesome soup that you can just throw together. It gets better the longer it cooks, but we usually can’t wait that long – either because it’s time to eat, or because we just can’t resist it. We make this soup often for family and friends when they come over because it’s delicious and easy and it warms you to the core. However, it’s one of the recipes that I don’t have written down anywhere. The first couple of times I make it each cold season, I have to dig around through emails, chat records, Facebook messages, and texts from Kate to see where it was that I last asked her for the list of ingredients. Lately, my family has asked for the recipe a lot, so I thought I’d put the list of ingredients here so that it’s easy for me to access and I can stop bothering Kate each Fall. Hoppin’ Johns: Loved by big people with big-people-bowls and little people with little-people-bowls alike. Also, those are corn muffins in our bowls. A must with Hoppin’ Johns. An absolute must.